I'd like to take a minute to toot our own horn. 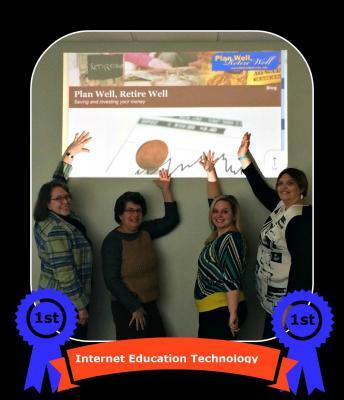 The writing team behind the Plan Well Retire Well blog just won two awards for Internet Education Communications from the National Extension Association of Family and Consumer Sciences (NEAFCS) at their annual conference held November 2-5, 2015 in White Sulfur Springs WV. We received first-place in the Central region which includes IL, IN, IA, KS, MI, MN, NB, ND, OH, SD, WI and first-place national honors . In receiving this honor, the awards committee said our "commitment to meeting the needs of individuals, families, and communities is exemplary." With so many blogs on personal finances available, we are especially honored to be recognized for this award. It reaffirms our commitment to bring you research-based, unbiased information on relevant topics, in a personal and readable manner. This blog is focused on demystifying financial topics that abound in our daily lives. Unlike many financial blogs, we do not create our blog posts to sell products; instead we write to empower people to make positive financial choices through education. The goal is to educate readers across the lifespan as financial knowledge truly requires lifelong learning; our financial knowledge needs as twenty-year-olds are different from those of someone approaching retirement. With our collaborative blog involving multiple writers, we can provide this lifelong, clarifying educational blog. Team members have their topics they are especially passionate about. We write about a multitude of topics including budgeting, credit and debt, health care, income taxes, investing, kids and money, retirement planning and more. We believe in writing blog posts that people can relate to, and because of this, often use events in our lives to direct the blog posts. Consider when Sasha Grabenstetter was planning her wedding, her blog posts discussed her adventures in shopping for a wedding dress and ways to keep honeymoon costs down. My blog posts often focus on our never-ending challenge to keep daily costs down. Kathy Sweedler's posts are more inclined to be about launching young adults financially and the challenges of paying for college and saving for retirement simultaneously. Karen Chan provides tax expertise and keeps us on track for making the most of our earned dollars. As financial educators we, like everyone else, are faced with financial challenges in our daily lives. In addition to giving our thanks to the NEAFCS for bestowing this honor on us, we'd also like to thank you-our readers-for your continued following of us on our journeys through life, in the hope we can help you as you journey through your lives. Without you, we'd just be sending words out into cyberspace. There are two ways you can keep up with our writings. One is to sign up for e-mail updates to the right of this entry. Every time a new blog is posted you'll get an e-mail reminder to stop by and read. The other is to sign up for our monthly E-Newsletter. The newsletter recaps each blog, has a link to take you directly to the one(s) that interest you most, and adds other helpful information and resources. You can register for the E-newsletter at the bottom of this column. Either way, we look forward to informing and entertaining you and hearing your comments.